Birthday greets from Micol, The Medic. Yes, The Wildgeeks Adventure Club is one year old. The number of geeks have grown since. The total number of geeks registered in the group currently stands at 39. Although some are not riding any more (one that I know was due to bike "breakdown" LOL...), I am sure their hearts are still into this. Poor Hulk still has his knee problem, which has put him out for more than 6 months now. Get well soon man! The Best Ride with the Most geeks? Best ever outing is the second hash to Batu Dam. Which is the Most Scary and Frightening Ride? This has just got to be the ride to Sofia Jane - A Cicak, An Incident and A Few Good Men. I for one was terrified for the not so hard Ironman... LOL. George received eleven stitches for not wearing a helmet while swimming in the waterfall... LOL. The Ride with the Most "Pokkai" or Falls? Edwin the Tau Foo Fa, started off the whole falling business with others to follow later. It was also the day I forgot my shoes and had to ride with my slippers... LOL. We have never had all the geeks together for an adventure. With everyone's tight schedules and responsibilities, it would be a wonder to get all the geeks together. Nevertheless, that would be something to hope for. Maybe we can organise a Jamboree or something like that... LOL. 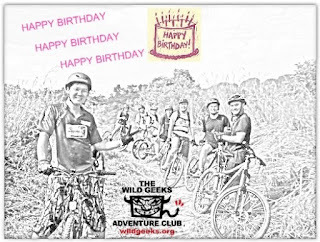 Anyways, here is wishing every wild geeks who like adventuring, a Happy Birthday with more great fun coming their way! jack... 9 stitches only la... choi... don't ever want to get 11! How come you never mention how you took me to a cardiologist to fix my head??? HAhahah... r u sure 9 only? I thought I distinctly told the doctor to add a couple more for insurance... LOL.